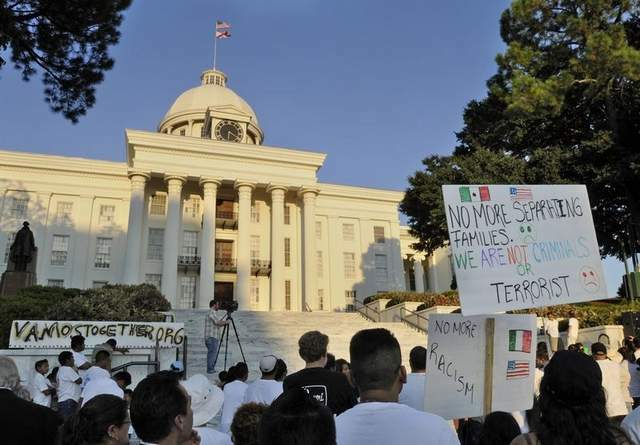 BIRMINGHAM, AL - Opponents of Alabama's law on illegal immigration are holding a rally tonight in Birmingham. The demonstration was originally timed to coincide with the law taking effect Earlier this week a federal judge temporarily blocked the law from going into effect, saying she needed more time to consider lawsuits filed by critics who believe the law is unconstitutional. Eliseo Medina, International Secretary-Treasurer of the Service Employees International Union said, “The law, signed by Gov. Robert Bentley in June, establishes racial profiling by allowing police to detain those they suspect are undocumented residents, based on the color of their skin. It turns businesses, landlords and educators into immigration enforcers and effectively creates a separate class of school students, in what we believe is a violation of the 14th Amendment’s Equal Protection Clause. ‘Good Samaritans’ also would be punished if they transported an undocumented immigrant anywhere, including to a hospital emergency room."